One very important factor often overlooked by PV solar panel (photovoltaic) owners are cleaning. Just like your car, the dirt and dust in the atmosphere can leave your pride and joy with an unsightly layer of grime attached. This dirt and dust can hurt your panels’ performance if left unchecked. The importance of cleaning your PV solar panels. With your feed-in tariff revenue for photovoltaic panels being reliant on producing the maximum amount of energy to gain the maximum amount of income, then the importance of keeping your solar panels clean seems obvious. Solar panels do work well, even when dirty. NASA’s Rovers have demonstrated this on Mars. With an expected lifespan of six months when first launched in 2004, the success of the rover’s longevity on the Martian landscape has been down to their extraordinary solar panels, which have kept the rover powered, despite their accumulated layers of red dust. So not keeping your PV solar panels clean, will not stop them from producing power, but if you want to keep the maximum rate of power feeding down into your generation meter, then periodic cleaning is advised. 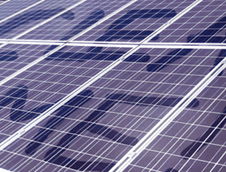 You will know this if you have a free PV solar panel system on your roof. These types of companies regularly pay contractors to keep their panels cleaned, to gain the maximum benefit from their investment. Private owners should do the same. If you own your panels, then maybe keeping your system clean may not have occurred to you, but just like the Mars Rovers, the atmospheric layers will of dust, dirt and bird poo, will begin to take its toll on the amount of power generated over time. Solar panel farms around the world, also have regular cleaning crews whom regularly inspect and clean the panel surfaces. A six monthly clean will not only pay for itself with the extra revenue it generates but will keep your system looking aesthetically pleasing throughout the different seasonal changes. There are some window cleaning companies which specialise in PV solar panel cleaning and will probably clean your windows as part of the deal too. Don’t miss out on your system’s full earning potential. The grime in most cases isn’t viewable from the ground level, so be wise, stay clean and maximise your power generation and ultimately your investment.